For now, it's time to concentrate on the Ironman 70.3 training. Less than 62 days to go. 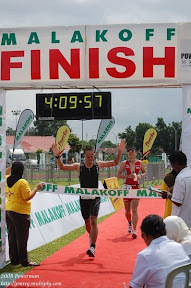 1.9km swim, 90km bike and 21km run. 112.9km altogether. I've also registered for the Borneo Headhunters Hat 2011 tournament organised by Sabah Ultimate. It is an Ultimate Frisbee tournament and a few Bruneians have registered for this tournament. Its gonna be held on the 26th February 2011 in Kota Kinabalu, Sabah. I'm doing this just for the fun of it and part of my hobby.